Hey gang, Valkor here. In the coming months you're gonna see a few 8/16 bit games get the HD update treatment; titles such as Duck Tales and Mickey's Castle of Illusion, for me, are hot on tap and I can't wait to play em. Hell even already released Double Dragon Neon is something of an HD remake, with some of the best music evar! So what happens when a game gets the throwback, 8bit treatment? 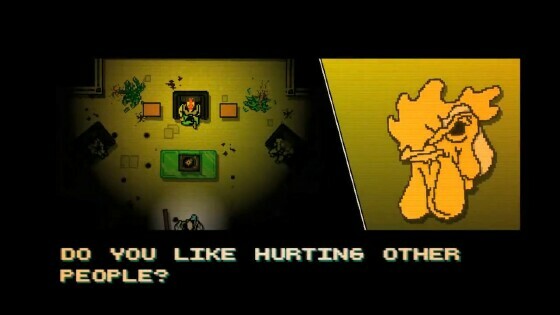 Then you get Hotline Miami from Devolver Games and Dennaton Digital for the PS3 and Playstation Vita. 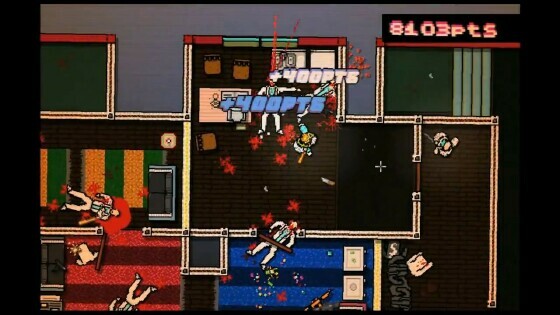 Hotline Miami is an 8bit style, 2D top-down actioner with some stealth elements, that's very reminiscent to the first Mission: Impossible game on the NES. You'll take on the role of a hitman who wakes up every day and checks his messages. Each message details a menial task he must perform such as appear for work at a massage parlour, meet with a client, or go on a repair job. However the job is anything but that and you wind up killing a room full of armed assailants. Much of the targets you tackle head on and for others you'll need stealth and precision in order to make it through to the end of the level. At the end of every third chapter or so you'll fight a boss character and at the start of the next act you'll meet with a room with three strangers wearing masks; they discuss the protagonist, what is his relation is to them, and what will happen on a certain date. Things get even weirder as you play through only to find out the world you're in… may not be real at all. And then things get even stranger when the biker kicks in. What's going on!? 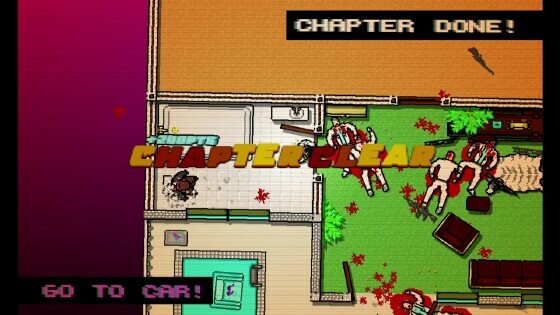 Hotline Miami has simple play mechanics; for starters you'll begin each chapter choosing a mask – in total there are 27 to unlock. And each mask gives the protagonist a certain ability, such as the giraffe mask for seeing further, a dog mask to avoid being attacked by dogs, a wolf mask which gives you a knife at the jump, and a rabbit mask that gives you extra speed. Once chosen, you'll hit the stage clearing out any and all enemies who wield an assortment of weapons that you can take and use. I'm playing the game mainly on the PS3 (there's cross-play so you can play on the Vita as well) and you'll use both analog controls – one for movement and the other to aim the crosshairs. R1 is used to punch/shoot, square/R2 is for a lock-on, L1 throws weapon, hold L2 to look around, O grabs weapon/item, and X is used during a prompt or to do a silent takedown rather than use a weapon. Weapons are a mix of melee, which are silent and long range, which makes a lot of noise and causes the enemy to chase after you. In total you can unlock up to 35 weapons. Hotline Miami is a one hit wonder, meaning one hit and you're dead, so the game requires a lot of patience as you'll die – a lot! Once you die, just hit the X button to jump right back into the action. Enemies are strategically placed and some will follow a pattern, while others will move about at random. Meaning just because you were able to swoop into a room and take down a bunch of enemies, doesn't mean you'll be able to do it again the same way. Thankfully most enemies go down with a single hit as well, so you won't get too frustrated. Survival is all in how you use your masks and weapons. 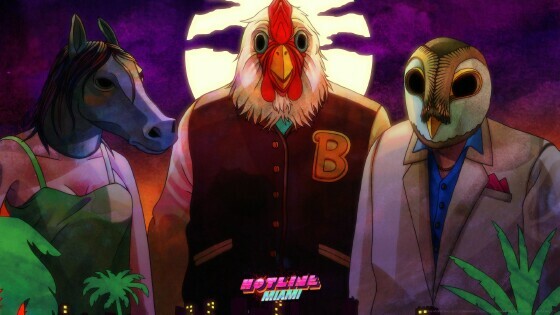 Hotline Miami isn't just a throwback to the 8bit era, but also to the 80s with an amazing 80s-esque soundtrack; some of the music, while original, have some familiarity to them. For instance, doth I detect a taste of Laura Branigan's "Self Control" or maybe even a smidgen of Herbie Hancock's anything, but especially "Axel F"? 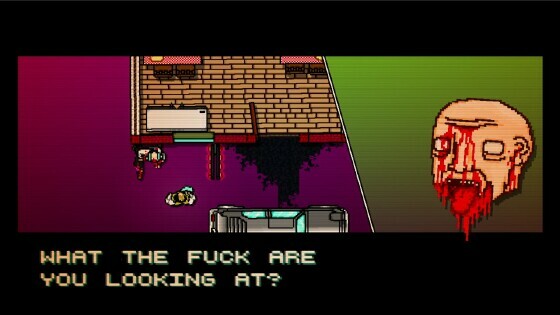 Hotline Miami is a fascinating title with loads of bloody action and a compelling story that will leave you shaken once it's all over. At least I found it very chilling because of the weird vibe it has. And is it addicting? Absolutely! I thought after the first few deaths I'd wanna quit, but I had to persevere and with each play through the controls felt more intuitive. Yep, the controls will take some adjusting, but they're not terrible. It took some getting used to, but ultimately I was able to pull off some cool moves, like edging my character just enough to take out a gunman long range. I love the idea behind the masks and it makes each play through a unique experience; some will definitely give you an advantage, while others will add to the difficulty. Finally the music is the game's biggest draw and if you're into 80's club type tunes you'll definitely sway to some of these mellow beats. 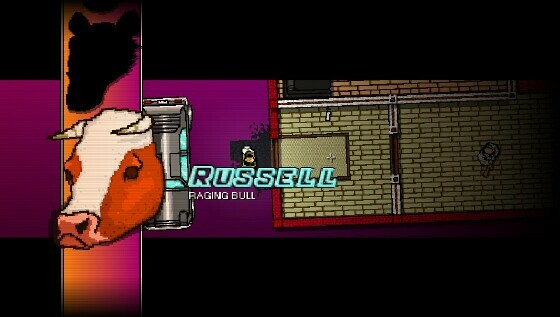 In the end Hotline Miami is fresh, dope, and totally radical, dude! The game's biggest drawback is the controls, which will take some getting used to. 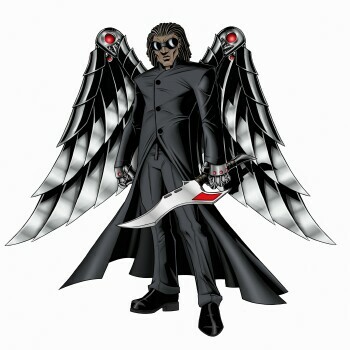 Granted if you stick with it, things won't be so bad, but I sense many a gamer might be frustrated having to use one stick to control your character and another for the cross-hair. I found it funny, but during the scenes where your character is either checking his messages or chatting it up with a vendor, the whole walking/cross-hair bit works tighter with one stick, but it's only when you dive into the action elements that it feels clunky. I also had some collision issues when I'd stand right in front of an enemy and my attack would go right through 'em or I'd stand right within an enemy, trying my best to strike him down only to get nailed. Yep there were many moments I wanted to toss my controller – and not from the game's increasing difficulty. Beating an enemy's head into the ground – gruesome! 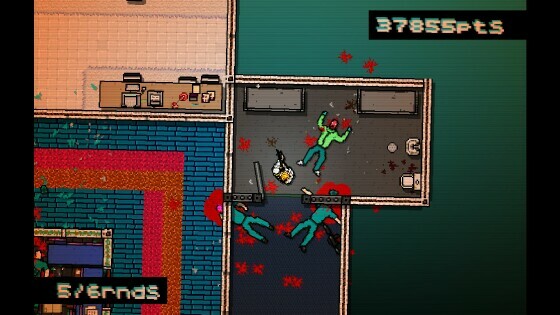 Hotline Miami is available now, not only on PSN and PS Vita, but also PC, Mac and Linux. And if you're looking for a challenge that's more addicting than frustrating with slick graphics and an amazing soundtrack, then you'll definitely wanna add this title to your gaming rotation. Out of TOV 5 stars, I'm giving Hotline Miami a 4 and it's been Valkor tested, TOV Approved!